Uncommon operating results from a non-traditional soda company. If you want results that differ substantially from the market, you must be willing to do things, um, differently. National Beverage Corp (NASDAQ:FIZZ) provides a great example of that maxim at work. The soda company's stock has trounced rivals with a 350% rally over the last decade, compared to 60% increases for both PepsiCo (NASDAQ:PEP) and Coca-Cola (NYSE:KO) and a 240% boost for Dr. Pepper Snapple (NYSE:KDP). It helped that National Beverage was ideally positioned to capitalize on growing demand for both sparkling water and energy drinks. But plenty more went into producing that long-term winning streak for investors. Like its rivals, National Beverage distributes a wide range of drinks including traditional colas, juices, energy drinks, and flavored sparkling waters. But, unlike peers, its portfolio is tilted away from the soft drink offerings that dominate the grocery aisles. While cola drinks take up roughly half of industry sales volumes, they account for just 15% of National Beverage's business. That outsized bet on non-traditional drinks has made a huge difference. Volume spiked by 9% in the fiscal year that ended this past April, compared to a 2% increase for Coke. This outperformance was driven by what National Beverage calls its "power brands," that include the LaCroix and Shasta sparkling water franchises and Rip It energy drinks. Power brand volume soared by 31% this past year to more than offset a slight decline in the rest of the portfolio. FIZZ Operating Margin (TTM) data by YCharts. Profits are rising at an even faster pace than sales, as net income jumped 24% last year to $61 million. The main factor behind that market-thumping growth has been higher average prices, which have supercharged profitability gains. 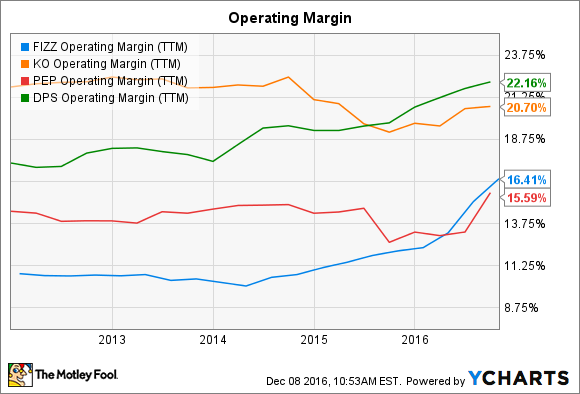 In fact, operating margin recently passed 16% to overtake PepsiCo and close the gap with both Coke and Dr. Pepper Snapple. National Beverage's management team takes a non-traditional approach to its communications with investors, too. Its quarterly press releases are packed with over-the-top language. For example, CEO Nick Caporella -- in one of six sentences in the short release that ended with an exclamation point -- said in November that his executive team is "more than triumphant with our first half results." Granted, the company had just managed its best six-month period to date, with net income rising 65% as revenue improved by 15%. That quirkiness extends to its capital allocation strategies. National Beverage Corp has announced plans to deliver a dividend to shareholders that increases along with the length of time that they have held the stock. Caporella calls it a type of loyalty program for investors that should "dramatically contrast our long-term shareholders and their devoted commitment with the short-term traders and short sellers who we believe seek to reduce the long-term shareholders' value." Can National Beverage continue climbing? The big risk with National Beverage's heavily focused portfolio is in its powerhouse brands, particularly the LaCroix and Shasta franchises, fading in popularity. If that happens, and if the company can't craft an equally attractive replacement, then sales and profit gains could disappear just as quickly as they arrived over the past few years. For now, though, there's no evidence of that happening any time soon. The LaCroix brand is growing at nearly five times the industry average, which positions the company well for future gains in a sparkling water industry that's projected to reach $5.5 billion of sales by 2020. The stock's valuation, at 30 times earnings, makes it slightly more expensive than all of its peers. But National Beverage is worth that premium, in my view, given its unique drink portfolio and improving profitability.